Adam J Purcell reminisces about his visit to BFI Southbank, London, for the Doctor Who: A Christmas Carol Premiere on the 13th of December 2010. Steven Moffat (the Vast Toffee (MN)) promised us the most Christmassy Doctor Who story yet and he doesn't fail to deliver. Don't worry, I will be avoiding anything spoilerish but the name of the episode itself will probably tell you what to expect, at least in terms of atmosphere. Imagine your standard Dickensian setting - the Victorian outfits, the stark social contrast and the ever present cold winter night. That last is particularly important, gone are the unfortunate outside shots from the height of summer of some previous Christmas specials, with their blatant green trees, yet purporting to be set in the middle of winter. Instead we have dark cobbled streets and fog. It is not just the setting that has been given the quintessential Christmas vibe but the story itself. An unabashed sentimental journey with a bittersweet undercurrent. Expect a lot of sparkling dialogue in the true Moffat fashion, including a great number of laughs, particularly from the Doctor, as has quickly become the norm with this Eleventh incarnation. Some may feel it is overly sentimental but personally I think it hits the perfect note for Christmas. As Moffat himself suggested in the Q&A session after the screening, Christmas stories are designed for that one special day of the year and should be locked away for the rest of the time. Being that this is so absolutely a Christmas story I suspect there will be some who do just that with it but I won't be one of them - in fact I've pre-ordered the Blu-ray and that won't be out until the 'I want to forget about Christmas' blues of late January. 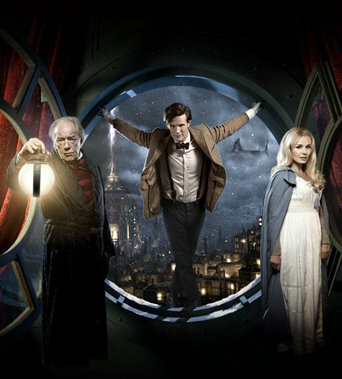 In many ways Doctor Who: A Christmas Carol is quite a small, intimate story. The mind bending Doctor Who fun that was demonstrated in, for example, The Big Bang is thoughtfully reigned in so as not to alienate the, hopefully, massive Christmas Day audience who might otherwise be turned off by such antics. What is there of that nature is very well presented so as anyone with an I.Q. greater than a pickled shrimp will have no trouble in following it. When you take out the inevitable 'monsters', the fun being poked at Star Trek and all the other window dressing you are left with a story of three people, a tale of love and possible redemption, exactly as you'd expect on Christmas Day. The performances of all the cast are first class but of particular note must be Matt Smith, Michael Gambon and Katherine Jenkins. Matt Smith is his usual brilliant, quirky Doctor and clearly completely understands how to work Moffat's words. Michael Gambon (indeed Sir Michael Gambon, knighted for his services to drama) delights with an amazing performance - don't expect to see even a hint of Dumbledore here but instead an old man on a journey with all the range that suggests and then some. Katherine Jenkins is the real surprise, however. It is well known that Matt Smith is a fan of hers and some may worry that the opera singer was cast for that sole reason. The fact that this is her first acting job was also cause for concern but one thing that New Who has done very well is casting and I'd even go so far as to say that the current production team, as evidenced by 'Series 5', has perfected the art. Therefore it should come as no surprise that Jenkins puts in a great performance and I genuinely wouldn't have known this was her first role. Certainly she wasn't asked to portray the range that Gambon was but she did bring surprising emotion to the part, with not a hint of stiltedness or woodenness. Not only did all three work well on their own but also together and such things are never a certainty. The presentation is sumptuous, exactly as you'd expect from a BBC period drama, which is exactly what this resembles. What most period dramas don't attempt, however, are big CGI effects such as spacecraft, planets and 'alien horrors'. I saw this on a BIG screen and it felt like a big budget film, for the most part. Any talk of reduced budgets really has no place in this story. I got the impression they threw an awful lot of money at the screen and, knowing BBC budgets, even for Christmas Specials, I highly doubt it was nearly as much money as it looked. That is a massive testament to their hard work. Having only seen it once, the music is a little harder for me to judge. The one problem the venue had was a rather poor speaker system. It is a common complaint that New Who (and Sarah Jane Adventures, probably also Torchwood) have a sound-mix that can make it difficult to hear the dialogue over the music sometimes. That is not a problem I usually experience (only occasionally on the recent low-bitrate CBBC Sarah Jane Adventures and never in Doctor Who itself), perhaps that is due to my, relatively, decent home speaker set up. At the BFI I really did notice it, however. I am assuming and certainly hoping that this is an artefact of the cinema we were in but if you are prone to such problems at home then I suspect you will get it again with A Christmas Carol. I can't leave the subject of the sound and music in particular, without mentioning Katherine Jenkin's singing. Yes, as has been well publicised before transmission, Jenkin's character sings. I'm no opera fan (to be honest I can't really see the point in listening to a musical story if I don't speak the language being sung!) but it seemed to me she did a great job but then you'd hardly expect otherwise from one of the top classical singers in the land. In the Q&A afterwards, there was talk of the piece being released in some form but they may just have been talking about the next Doctor Who Soundtrack. Time will tell. A Christmas Carol is a very different beast to The Christmas Invasion. The stakes seem much smaller in this new one and I never really felt the threat I think I was suppose to. A Christmas Carol is certainly wittier and more heartfelt, it's not meant to be about high jeopardy, the danger is a backdrop to a more personal story whereas I'd say it's the other way around with The Christmas Invasion. I really can't decide, it is between those two, though. Maybe after I've seen it again, on Christmas Day, I'll be able to judge it better. The fact it is even in contention with The Christmas Invasion, in my mind, speaks volumes, however. I should quickly give an impression of the BFI event itself and not just the story, though. First off, I am very grateful to the BBC and the BFI for putting on this event and I feel very lucky and privileged to have been able to attend - tickets were nigh-on impossible to obtain and were never available to the general public. Before the screening was a little carol service in the foyer, performed by children bused in from Cardiff especially. Their reward was a seat each to watch A Christmas Carol. I had heard talk that Katherine Jenkins would be joining in with the singing and perhaps even Matt Smith and Karen Gillan. Sadly none of them did but they were on hand at one point to pose for photos besides the Police Box and red 'new paradigm' Dalek set up the foyer. Unfortunately my three compatriots and I were in the bar when his happened! After the screening we were entertained by Matt Smith, Katherine Jenkins and Steven Moffat being interviewed on stage by Caitlin Moran, TV critic for The Times newspaper. Steven Moffat in particular was his usual witty self and rather stole the stage, with Matt and Katherine giving interesting and occasionally funny replies to their questions but few can keep up with the very smart and articulate Moffat. Karen Gillan didn't join in with the panel, though she was in the audience and even asked a question of them! Gillan was the only person to be asked to stand up to ask her question, so as we could all see her Moran claimed (and it does have to be said that Karen Gillan is, somehow, even more beautiful in real life!) I'm not sure if Gillan was taking the mickey out of fans but the way she asked her question did remind me the way some particularly sad fans might! Her odd question referred back to something little Amelia thanked 'Santa' for in the Eleventh hour and how that related to A Christmas Carol (don't worry - no spoilers, Moffat said it didn't but that the word was just inherently funny! I'll leave it as an exercise to the reader to figure out what it might have been so as not to spoil anyone!) Otherwise the Q&A entertained more than enlightened but it was certainly well worth seeing. Hopefully the BFI will publish the panel video on their BFI Live website in due course. In summary, I found Doctor Who: A Christmas Carol to be an intimate story with great laughs and a poignant message, blessed with very strong performances, all set in a traditionally festive Dickensian world with the twist of your typical Doctor Who space and time madness! Probably set to be the best thing on TV this Christmas by most people's measure and certainly so by the likes of you and me. The new production team and cast of Doctor Who have taken Christmas by the scruff of the turkey neck and given us a feast that nobody will later regret!